Good to know: This plugin has been developed by NopCommerce, there are several ways to get support from them. Send your NopCommerce transactional emails and SMS via SendinBlue. This allows you to see all email statistics (subscription confirmation, etc.) and send emails, etc. Create a free SendinBlue account at www.sendinblue.com. Go to your NopCommerce back office. In the left-hand menu, in the "Configuration > Plugins > All Plugins and Themes" section (1), look for SendinBlue (2 and 3) using the search bar. Then click on Download (4). On the SendinBlue plugin page, click on "Get Extension" to download the file in .rar format. Install the extension on your server. Go to your NopCommerce back office. In the left-hand menu go to "Configuration > Plugins > Local Plugins", and then click on "Configure". In the "General" tab, enter your SendinBlue API key that you will find here. Then click on "Save". Once you have done this you should be able to see your account details. The "Synchronization" tab enables you to synchronize your NopCommerce customers with your SendinBlue account. From the drop-down menu, select the list to which you want the contacts to be added. You can also create a new list by selecting the "<New List>" option and entering a list name. This new list will be automatically created in SendinBlue in a new section called "NopCommerce". Automatic by checking the "Auto Synchronization" box (1): simply define the frequency synchronization you want by entering the number of minutes. 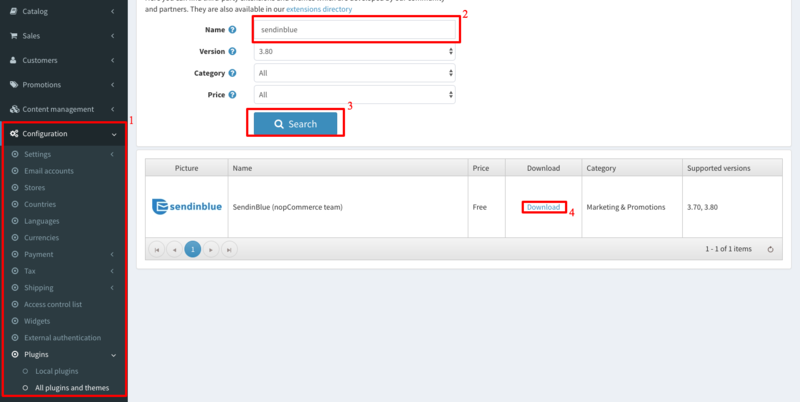 Manual (leave box unchecked): click on the "Manual Synchronization" (2) whenever you want to synchronize your NopCommerce contacts with SendinBlue. The "Transactional Emails" tab lets you determine whether you want to send your transactional emails via the default NopCommerce or SendinBlue SMTP. To send your transactional Emails via SendinBlue, check the "Use SendinBlue for notifications" box and using the drop-down menu, select which sender you wish to send your emails from. Click on "Save". You should then be able to see the email notification list. This lists all of the transactional emails (order confirmation, etc.) that you send. You can edit these and select your templates from this NopCommerce list. 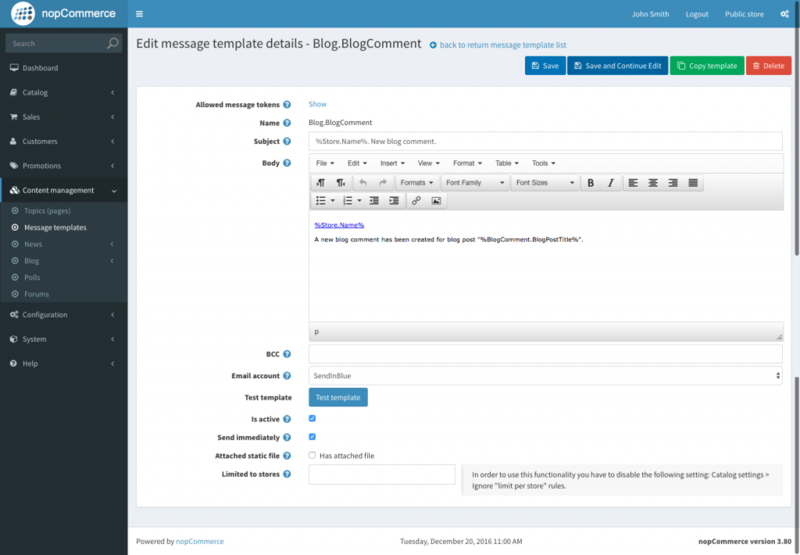 You can also edit the contents of your email by clicking on "Edit Template". You can also send a test email from this page to check the content. Note: an email credit will be used for each test email. As well as Emails, you can send SMS notifications to your customers. Go to the "SMS" tab and check the "Use SMS notifications" box. Enter an alphanumerical (maximum of 11 characters) as well as your telephone number, then click on "Save". To configure the SMS notifications to be activated, click on "Add new SMS notification" (1). Then select the event for which you want to configure a notification (2), the telephone number you want the notification to be sent to (yours or a customer's) and enter the text message. Make sure you check the "Is SMS active" box to activate the notification and click on "Update" (3). Your plugin is now configured. You can access all of your transactional email stats directly from SendinBlue. Visit NopCommerce forums. They are free and mostly provided by NopCommerce community (sometimes by NopCommerce team). Post the issue on NopCommerce plugin repository.